Antonio Murdaca, of Adelaide, Australia, was crowned champion of the sixth annual Asia-Pacific Amateur Championship (AAC) at The Royal Melbourne Golf Club in Melbourne, Australia. Murdaca became the first Australian to win the AAC since its inaugural event in 2009. He closed with a final-round 1-under-par 71 that left him seven shots clear of the field, the largest winning margin in event history. The 19-year-old’s win clinched him a spot in the 2015 Masters Tournament, in addition to the Open Qualifying Series for The Open, where runner-up Mikumu Horikawa of Japan would join him. After posting strong rounds of 69, 68, and 67, Murdaca saw his lead shrink to five shots through the front nine in the final round, with Horikawa gaining on him. It was the only time he felt any pressure, but Murdaca immediately responded with a 20-foot birdie on the par-4 10th. Two perfectly struck shots at the par-5 14th set up another birdie to get his advantage back to seven. Murdaca, joined by his coach Gareth Jones on the bag as his caddie, made a string of pars to finish his round. By the time he hit the green in regulation on No. 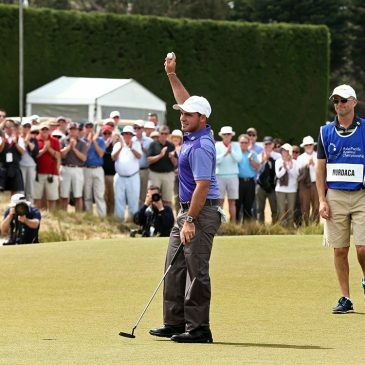 18, he was prepared to acknowledge that he had won, and waved to the large crowd surrounding the green. Murdaca finished at 13-under-par 275 for the championship. Established in 1891, Royal Melbourne is Australia’s oldest golf club and is one of the country’s premier golf venues. It has hosted prestigious events such as the Presidents Cup (1998, 2011), the World Cup (1959, 1970) and the Women’s Australian Open since 2012. The AAC was contested over Royal Melbourne’s original Composite Course, which was created in 1959 for the Canada Cup (now the World Cup). This setup consists of 12 holes from the West Course and six holes from the East Course. No weather delays occurred throughout the week. The mornings were cool and windy with lows around 13 degrees Celsius and up to 18 mph winds. Sunday was warm for the final round, with a high temperature of 26 degrees Celsius.